Miindia welcomes A R Rahman & group to Michigan. Indian Film Singers form an essential component of any Indian blockbuster. Michigan welcomed the Indian Singers of the computerized era who all have only one thing to say “A R Rahman is an experimental genius”. A few singers landed in Michigan after their electrifying performance in LA. Miindia always has a unique charm of welcoming Indian personalities and what better way than package their intensity for the Asian Indian community. ARR, SPB, Sonu Nigam, Udit NarayanShankar were yet to arrive, but Hariharan, Vasundhara, Sukhwinder, Sivamani, Mahalaxmi, Sadhana had already landed and were rearing to go! Singing from the age of 10, Vasundhara’s foray into Indian film music began after her graduation in Math/Statistics. This sensible Bangalore girl wanted to check the commercial reality for musicians and so Chennai beckoned her. “Tamil Music experiments different styles and Shakalaka Baby was my first hit which is actually dear to my heart”, said the beautiful Vasundhara. Vasundhara met A R Rahman through a friend of hers and thus began her slow claim to fame. Apart from being a wonderful singer, Ms. Das is also a very well known film actress – Monsoon Wedding, Hey Ram and a few more. Touted as the most expensive singer in Bollywood, the sensitive and eloquent singer was all excited to perform in Michigan. Sukhwinder Singh achieved national fame with his instant hit Chaiyya Chaiyya. Other films followed, notable among which are Taal, Biwi No 1, 1947 Earth, Daag, Dillagi and Thakshak have now made him a household word. Sukhwinder owes a large part of his success to Rahman's encouragement, and makes no effort to gloss over that fact. “I am very choosy about my songs”, mentioned Sukhwinder. According to him, music is not a challenge. “Its not a game as to who sings well. To me music is cool. It is the vocal chord that provides a soothing environment”, he elaborated. Speaking about the genius ARR, Sukhwinder admires Rahman for his experimental techniques. “He is a very nice and comfortable human being. He is a bridge between confidence and confusion”, he mentioned. Sukhwinder finds Michigan to be very cold. According to him, the stage is a very stylish and energetic life platform where you could feel the audience right next to you. Its melody and dance and the entire fan fare. Sukhwinder’s new album ‘Mitti’ is something to look forward to. His personal favorite is the title song “Dil se Re” from the movie “Dil Se”. The Michigan Indian audience can see the change in Sukhwinder (this singer is on a major diet spree, I guess) tonight as he performs live with his impeccable style. The one and only Chennai’s very own Sivamani! 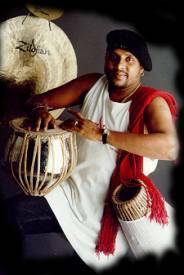 SIVAMANI: PERCUSSIONIST, CHILDHOOD FRIEND CLOSE ASSOCIATE of AR Rahman. No AR Rahman music is complete without the best pair of hands in the world of percussion - Anandan Sivamani. Zakir Hussain describes him as a phenomenon that walks through this planet but once or twice in a century..
Sivamani spoke exclusively to miindia. Asked about his passion and gift for music, Siva attributes his very being to his parents. “This gift was given to me by my parents. I was fine-tuning my mom’s heartbeat while I was in her womb”, Siva casually mentioned. Siva has always firmly believed to take life as music. He loves sharing his music with everyone and was very instrumental in bringing A R Rahman to the glossy world of Indian Film Stage Shows. Siva considers A R Rahman as his close buddy, and admires ARR for his skill as a music connoisseur, composer and a genius. It was the magic of international master, Noel Grant, which enchanted Sivamani. Noel Grant's recordings filled him with awe, and ecstasy. Also inspired by Billy Cobham, who became a role model - in 1990, he actually shared the stage with the legend at Mumbai's Rang Bhavan. Starting his music career at the age of 11, Sivamani recently shifted to Mumbai as there is so much international activity in the music world. Sivamani mentioned that his music can be seen in tonight’s show as a “beat that would exist from top to bottom”. Sivamani reveres SP Balasubramaniam – touts him as his God father and loves working with Hariharan. His first ghazal album with Hariharan “Kaash” was released two years ago. Siva used to play with vessels in his mom’s kitchen and he still uses those for his music. What’s Sivamani’s favorite place in the world, no points for getting this right – The Kitchen filled with vessels! Look for the live wire, the man who gave a new meaning to Indian music, acclaimed as one of the best percussionists in the world, catch Sivamani in action tonight! Miindia.com thanks Rajesh Sharma and Deepak Kumar (Bitu) of Palace Entertainment for facilitating these interviews.